In the rose haired tarantula, the body is divided into two segments, the cephalothorax (a fused head and thorax) and the abdomen. The cephalothorax contains the mouthparts, the eyes and the legs. The abdomen contains the reproductive structures and the silk-producing structures. Almost all spiders breathe through organs known as book lungs. These are hollow leaf-like structures through which the blood flows, so that the blood can acquire oxygen to be distributed thoughout the body. The opening to the book lungs is located below the abdomen. All arachnids have piercing mouthparts called chelicerae. In spiders, the chelicerae are modified into fangs. At the base of the fangs are poison sacs that are used to subdue prey. The bite of the tarantula is not very painful or dangerous to humans, unless one has a severe allergy. Tarantulas primarily use their fangs to catch and subdue prey, and only rarely in response to threats. Tarantulas do not build a web to trap prey. Also, they do not have good eyesight. They hunt at night, detecting their prey by touch. They may use a web, created by structures at the end of the abdomen called “spinnerets”, to act as a “trip wire” to alert them to the presence of prey. Since they cannot consume their prey whole, they must first liquefy the insides of their victims with a caustic mix of digestive enzymes. Bands of contracting muscles surround the tarantula’s stomach and generate a powerful sucking motion. The tarantula’s narrow mouth opening then acts like a straw for the solution to be sucked into the digestive tract. A fully mature Rose Hair can reach approximately 5 inches (12.5 cm) with legs extended. They have a brown body, but the cephalothorax is colored a slight metallic pink, giving them their name. One way they protect themselves is by flicking abdominal hairs at the attacker. These hairs can irritate the skin, eyes and nose. 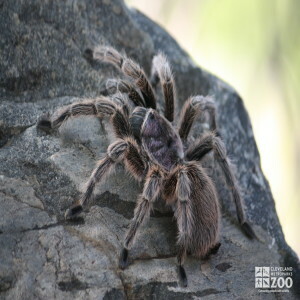 The range of the rose haired tarantula is Chile, Bolivia, and Argentina. Rose haired tarantulas inhabit dry areas, such as deserts and scrubland.